Are you looking for a different girls birthday party idea near Sleaford? Why not have a look at what we have just introduced? 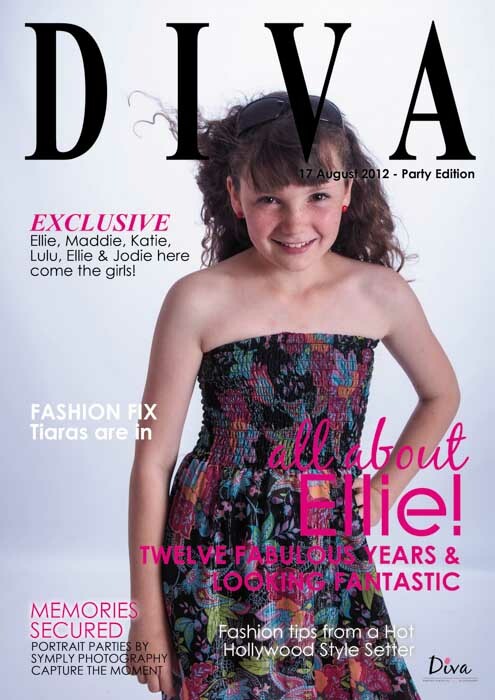 The Diva Portrait Parties are proving to be very popular and are a lot of fun! Ellie came along with several of her friends for her 12th birthday party the other day. The girls had brought a variety of clothes to change into and had a lot of fun deciding what they were going to wear. After showing them around the party bar that was all decorated up with banners and disco lights, we took the girls into the studio and showed them some simple posing tips. A choice of props and accessories and suitably loud music and they soon were relaxing and giggling whilst we took their photos. Once we had finished it was up to Ellie to choose the photo she wanted to give as a gift for her friends, and for the cover shot of her. Whilst we got to work on their finished images the girls went down to the party bar to tuck into the party food that was waiting for them (including jelly of course!) The stunning secret finale was greeted with whoops and cheers but signaled the end of the party – all the girls said they had had an amazing time – and could they do it all again please!